Here is the list of the hotels near Fargues-Saint-Hilaire. Book your hotel near Fargues-Saint-Hilaire today, Saturday 11 May for the best price, reservation and cancellation free of charge thanks to our partner Booking.com, leader in on-line hotels reservation. Below here is the list the 50 closest hotels of Fargues-Saint-Hilaire, sortable according your criteria. You will find the position of these accommodations on the Fargues-Saint-Hilaire hotels map. Set 10 km from Bordeaux, in the countryside, Hôtel d'Arcins offers free Wi-Fi throughout, a terrace where guests can eat weather permitting and air-conditioned bedrooms. The bedrooms all have a wardrobe, flat-screen TV and a private bathroom. In the morning, a continental breakfast is available, including orange juice, jam, honey, cheese, pastries, cake, cereals and yoghurt. A traditional restaurant can be found 50 metres away. Wine tastings and horse riding are available 2 km away and there are walking and cycling paths beside the hotel. Hôtel d'Arcins offers free parking. Situated in Floirac, off the A630 (exit 23), Hotel Altica Floirac is a 12-minute walk from Bordeaux Métropole Arena. With free WiFi, this 2-star hotel offers a 24-hour front desk with a personalised welcome. Each room has a flat-screen with all TNT, Canal + and beIN Sport channels, as well as a telephone. Rooms are serviced by a lift. The private bathrooms are equipped with a shower. A buffet breakfast is served each morning in the breakfast room. Bordeaux City Centre is 7 km away and Mérignac Airport is 14 km from the property. There is free closed parking on site. Situated in Camblanes-et-Meynac, Château Du Tasta offers accommodation with free WiFi and access to a garden. A terrace with pool views is offered in every unit. The bed and breakfast offers a continental or vegetarian breakfast. Guests can also relax in the shared lounge area. Bordeaux is 16 km from Château Du Tasta. The nearest airport is Mérignac Airport, 29 km from the accommodation. Set in Camblanes-et-Meynac in the Aquitaine Region, 12 km from Bordeaux, Chateau Ysard features an outdoor pool and views of the pool. Free private parking is available on site. The room includes a private bathroom with a bathtub. There is a seating area to relax in after a busy day as well as a private terrace. You will find a kettle in the room. For your comfort, you will find bathrobes and free toiletries. Chateau Ysard features free WiFi throughout the property. There is a shared lounge with a fire place and board games at the property. A breakfast with fresh juices and homemade jams is served every morning on your terrace or in the kitchen. Saint-Émilion is 29 km from Chateau Ysard, while Mérignac is 16 km from the property. Mérignac Airport is 20 km away. Boasting a garden and a terrace, La Galoche features accommodation in Floirac with free WiFi and garden views. The Arkéa Arena is within 1 km of the holiday home. The holiday home has a satellite flat-screen TV. A dishwasher, an oven and a microwave can be found in the kitchen. Bordeaux Métropole Arena is less than 1 km from the holiday home. The nearest airport is Mérignac Airport, 23 km from the property. With barbecue facilities and a garden, Les Platanes provides accommodation with free WiFi. The accommodation is air conditioned and has a spa bath. The apartment provides guests with a terrace, a seating area, a flat-screen TV, a fully equipped kitchen with a dishwasher, and a private bathroom with hot tub. An oven, a microwave and toaster are also offered, as well as a coffee machine and a kettle. The property has a hot tub. Cycling can be enjoyed nearby. Bordeaux is 12 km from Rives de Garonne, while Saint-Émilion is 44 km away. The nearest airport is Mérignac Airport, 25 km from the accommodation. Guest accommodation Quinsac Preferred hotel ! Surrounded by a 9-hectares park, Casa Branda Bordeaux offers an outdoor swimming pool, a tennis court and a billiards table. Guests are invited to relax on the terrace or in the library. The property proposes individually decorated guest rooms and self-catering apartments. Some have a private garden and a terrace with a barbecue and others have a view of the park, the pool or the tennis court. Breakfast is served daily for guests staying in rooms and includes fresh fruit and homemade cake and jam. Evening meals prepared by the hosts and featuring products from the garden can be prepared upon request. Free private parking is available on site and the Garonne River is 4 km away. The property is 16.5 km from Bordeaux-Saint-Jean Train Station and 12 km from exit 22a of the E72 motorway. Hotel Bègles Preferred hotel ! This residence is located just 3 km from Bordeaux city centre. It offers air-conditioned rooms and free on-site parking. Internet access is available. 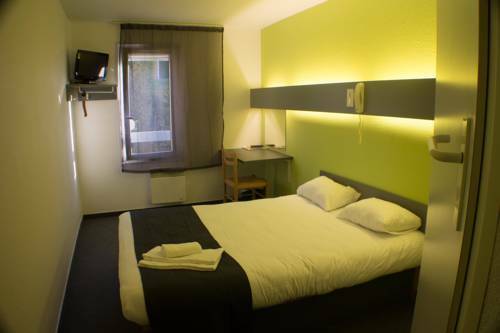 Rooms at Teneo Apparthotel Bordeaux Begles are equipped with a flat-screen TV, telephone and private bathroom. Each room has a kitchenette, a courtesy tray and some overlook the Garonne River. The rooms are lift-accessible. Guests can relax with a drink in Teneo Apparthotel Bordeaux Begles’s bar. They can also have dinner on site. Additional facilities include a business centre. Bed and Breakfast Saint-Caprais-de-Bordeaux Preferred hotel ! Located in Saint-Caprais-de-Bordeaux, Chateau Canteloup offers accommodation with a flat-screen TV. Complimentary WiFi is provided. A continental breakfast is served each morning at the property. The bed and breakfast offers an outdoor pool. A terrace is available for guests at Chateau Canteloup to use. Bordeaux is 22 km from the accommodation. The nearest airport is Mérignac Airport, 34 km from the property. Located in Bègles, Kyriad Bordeaux Bègles is close to Tramway and bus service offering direct access to Bordeaux town centre and the SNCF train station. It is also 15 minutes from Bordeaux airport. Guestrooms at Kyriad Bordeaux Bègles are air-conditioned and equipped with free WiFi internet access and flat-screen satellite TV. Guests can enjoy a meal at this Kyriad’s restaurant La Table de Joséphine, which serves traditional French cuisine prepared with fresh and seasonal produce. It is open for lunch and dinner from Monday to Thursday and for lunch on Friday. Offering free WiFi and garden views, Le Gîte is an accommodation set in Quinsac. Guests staying at this holiday home have access to a fully equipped kitchen. The property includes a living room with a flat-screen TV. Guests can also relax in the shared lounge area. Bordeaux is 16 km from the holiday home, while Saint-Émilion is 47 km away. The nearest airport is Mérignac Airport, 29 km from the property. Offering free bikes and a garden, and surrounded by vineyards, Château-Lestange is located in Quinsac, a 20-minute drive from Bordeaux. Each room here will provide you with a terrace, a TV and cable channels. Featuring a bath or shower, each private bathroom also comes with a hairdryer and free toiletries. You can enjoy garden view from the rooms. At Château-Lestange, other facilities include a shared lounge. An array of activities can be enjoyed on site or in the surroundings, including cycling, horse riding and hiking. Mérignac Airport is 18 km away. Located in Bordeaux, hotelF1 Bordeaux Ville offers a 24-hour front desk, a terrace and free private parking on site. The hotel also features free WiFi throughout. All rooms include a flat-screen TV and a sink with a mirror, and guests have access to toilets and spacious showers next to the rooms. Guests can purchase microfibre towels at the hotel at an extra cost of EUR 3 each. Just a 10-minute drive from the hotel, Bordeaux city centre can be explored. The Stone Bridge is 1.8 km from hotelF1 Bordeaux Ville, while Saint-Michel Basilica is 2 km away. The nearest airport is Mérignac Airport, 13 km from the property and Bordeaux St Jean Train Station is a 7-minute drive away. Located in Bordeaux, a 10-minute drive from the city centre , Loft Zen offers a garden with a terrace. There is free WiFi access throughout this bed and breakfast. Each room at Loft Zen is air-conditioned and includes a private bathroom. A continental breakfast is served daily. The bed and breakfast is 1 km from Pont de Pierre, 3 km from Saint-Michel Basilica and from Great Bell Bordeaux. Bordeaux St Jean Train Station is 4 km away. Free parking is available on site. Set in Lormont, B&B Hôtel Bordeaux Lormont features air-conditioned rooms with free WiFi. All rooms boast a flat-screen TV with cable channels and a private bathroom. At the hotel, each room is equipped with a desk. All units include a wardrobe. Breakfast is available daily, and includes continental and buffet options. Bordeaux is 12 km from B&B Hôtel Bordeaux Lormont, while Saint-Émilion is 35 km away. The nearest airport is Mérignac Airport, 19 km from the property. Below here is the hotels map of Fargues-Saint-Hilaire. Names and details of Fargues-Saint-Hilaire hotels can be shown on the map clicking on the prices icons.